At the end of May to the very beginning of June I was in Austin, Tx attending the third and final Vida Vegan Con. I’ve been lucky enough to attend the last two. I wish VVC would happen again. Its been a great way to get myself out of NJ for a couple of days but I understand what an undertaking it is for the 3 lovely ladies who organize everything. I’ve never been to Texas and I’ve heard so many good things about Austin that I couldn’t wait to go. I wanted to eat all the food! We arrived in Austin around 10 am on a Thursday. After checking into our hotel room we decided to go to Counter Culture for our first meal. Everything on the menu sounded so good! 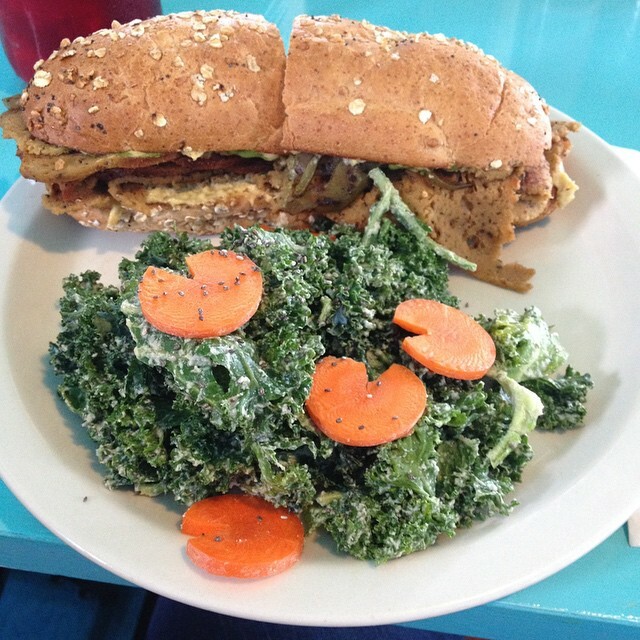 Eventually I settled on the Philly Seitan Cheesesteak with a Pac Mac Kale Salad on the side. It took me a bit to realize the carrots were purposely cut into little pac man shapes! The meal was delicious and it left me wanting to come back and try something else..which we eventually did. 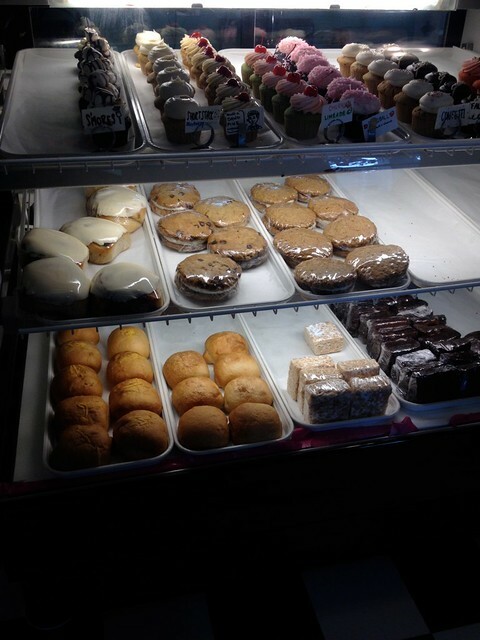 Right down the road from Counter Culture is the famed vegan bakery Capital City Bakery! I couldn’t wait to see this place! I’ve been following the owner Kristen Davenport on various social media outlets for quite some times now…before she even started the bakery as a food truck. It was so nice to see someone’s dream realized and in such a cute space. Sadly I didn’t get any pictures of the cuteness only the one dark photo above. The space isn’t dark at all! I was so tired from being up at 4 am for our flight that I just didn’t think to take more pictures. I ended up buying a brownie to bring back to the hotel. It was one of the best brownies I’ve ever had from a bakery! We ended up back at the hotel and had a quick nap and rest before heading out to the unofficial official meet and greet at The Buzzmill. I’ll blame jet lag or maybe it was just the incredible Texas heat but I somehow didn’t take a single picture! I felt like I was melting it was so hot. I assure you that the vegan eggrolls I ate for dinner, at the Golden Spike Rail Cart, which is in the backyard of The Buzzmill, were amazing and worth sitting in the sun for! I’ll admit now that this was my least favorite meal during my entire trip. The company and conversation was lovely and I truly enjoyed myself. I just could have done without this meal. It wasn’t terrible. It just wasn’t memorable. 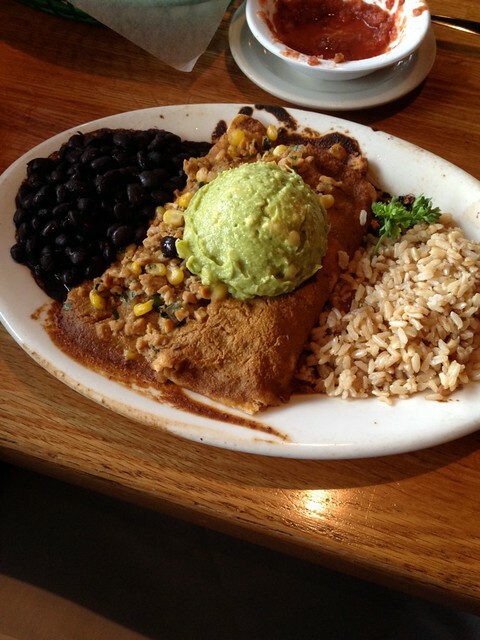 I ordered the Spicy Tempeh Enchilada’s. For me..more needed to be done to the tempeh for my liking. I did however really like their Spicy Cashew Chipotle Sauce that topped the Enchilada’s and their black beans were good too. What I liked about Mother’s Cafe is how easy they make it to veganize almost anything on their menu and I would go back and try something else if I ever find myself in Austin again.